The world will not end, nor will everything suddenly and miraculously turn bright and beautiful just because our man - made calendars show the number "2000" on their covers. We will not even be endowed with higher levels of consciousness from the switch of a date - It's entirely up to each of us, don't blame the date. The millenium is man made and so is what it will stand for and bring us - or rather what we will bring upon ourselves... Heaven and hell are states of mind, their physical manifestation lie in our hands alone and always have. So if you want a bright future, a wonderful fate, go out and fashion it - for yourself and for the world. Visit "The Hunger Site" at the UN ! All you do is click a button and somewhere in the world some hungry person gets a meal to eat, at no cost to you. The food is paid for by corporate sponsors, who gain advertising in the process because you see their logo. One of many ways to protect the world we live in - this one uses "direct action" and has achieved and matured a lot over the decades. 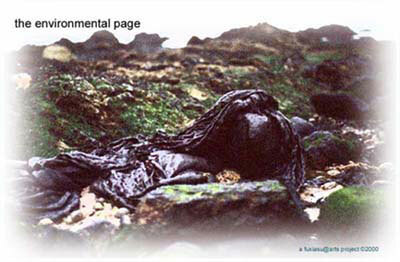 TEP's page on the desaster on Brittany's coast winter 99/00 in which an oil tanker called Erika crashed uder dubious circumstances, polluting the French Atlantic coast and causing lasting damage to its ecosystem as well as the inhabitants. Webring/ directory for environmental issues. Centre For Alternative Technology - A Centre for finding and promoting solutions for sustainable development. Volunteers for practical work welcome! This site is brandnew and still under construction, however, will be updated shortly.